The McCloud TV show was a crime action series on NBC that aired for 60 minutes during the first season, 90 minutes during seasons 2-4 and 7, and for 2 hours during seasons 5 and 6. It was about a country Marshall from New Mexico who escorted a local criminal to New York City. He got involved in a murder case and was ultimately assigned to stay in New York in order to learn the latest methods of law enforcement. His big city counterparts looked down on the country boy and also resented how he always managed to catch criminals that they couldn't apprehend! McCloud proved that you can find brains underneath a cowboy hat! Sam McCloud owed his assignment to New York City to his girlfriend, "Chris Coughlin" who had a cousin who just happened to be the NYPD Deputy Police Commissioner. Chris talked him into temporarily assigning McCloud to the NYPD. McCloud worked in the detective bureau of the NYPD. His Chief resented being ordered to take on the "good ole boy" from New Mexico and assigned McCloud to a series of petty little unimportant cases that somehow always managed to become something bigger than the first appeared (most often murders). McCloud never had its own exclusive time slot. In the first season, McCloud shared its time slot with three other series titled "The Psychiatrist", "Night Gallery", and "San Francisco International Airport (aka: "SFX"). McCloud was the first to air its episodes and then each of the other series took their turns. Together, they were referred to as one series with the title, "Four-In-One". Only McCloud and Night Gallery were renewed for a second season with Night Gallery getting its own time slot. McCloud shared its new time slot with two other new series titled, "Columbo" and "McMillan and Wife". Together, they were referred to as "The NBC Mystery Movie" and they took turns airing on alternate weeks. For the next two seasons, another series was added to the mix titled, "Hec Ramsey" and the combined name changed slightly to "The NBC Sunday Mystery Movie". The following season, Hec Ramsey was replaced with "Amy Prentiss". The next season Amy Prentiss was replaced with "McCoy". The following season McCoy was replaced with "Quincy, M.E.". That was the end of McCloud and all of the other series except Quincy, M.E. which ran another three seasons in its own time slot. Dennis Weaver is both an environementalist and a vegetarian. He built a home from almost all recycled building materials. He participated in the 1948 Olympic trials, getting first place in the 1500 meter run and placing 6th in the Decathlon! He nearly lost his role as Marshall Matt Dillon's sidekick, "Chester Goode" on the 1955-1975 series, "Gunsmoke". He asked if he could re-audition and it was allowed. The second time he used that southern-drawling, country boy accent that audiences loved later on Gunsmoke and that got him the part! The creator of McCloud was Herman Miller. Miller also co-wrote the screenplay for the 1968 movie, "Coogan's Bluff" which starred Clint Eastwood as a cowboy in the big city. Doesn't that sound familiar? In the 1989 reunion TV movie, "The Return of Sam McCloud", McCloud had become a senator from New Mexico! McCloud's love interest, Chris Coughlin (played by "Diana Muldaur") also appeared in the movie. For those of you who don't remember Diana Muldaur from seeing her on McCloud, you might recognize her as the Enterprise's second doctor, "Commander Katherine Pulaski" who replaced "Doctor Beverly Crusher" when she left the Enterprise on "Star Trek: The Next Generation". 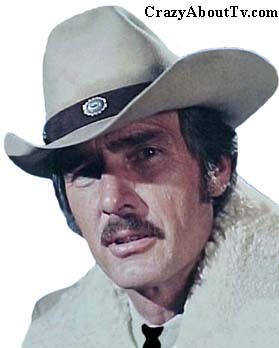 The McCloud TV show itself and Dennis Weaver individually both got Emmy nominations in both 1974 and 1975! In 1974, the show lost its Emmy to "Columbo" and Weaver lost his to "William Holden" on the 1975 version of the series, "The Blue Knight". In 1975, McCloud lost to "The Benjamin Franklin Miniseries" and Weaver lost to "Peter Falk" on the series, "Columbo". Many people are familiar with Dennis Weaver's two big hit series, "Gunsmoke" and "McCloud" but Dennis also starred on three other series titled, "Kentucky Jones", "Emerald Point N.A.S. ", and "Buck James". The Return Of Sam McCloud (11/12/1989) - McCloud is now a Senator representing New Mexico! Thank you for visiting our McCloud TV show page!